A day for shopping and to do good. Damiani Confirms its participation in the Pink Ribbon Campaign, now in its 19th edition in Italy. The event will take place in October and sees the LILT, the Italian League for the Fight against Cancer, in the first line to fight breast cancer, a disease that affects too many women in the world. Like last year, even the house of jewelry has Decided to make its contribution: for the day of the October 6, at the Damiani boutique on Via Montenapoleone in Milan, you can buy the rings from the collection Damiani D.ICON: 10% of sales will go to the Pink Ribbon. Not only jewelry and beauty then. Damiani has always been very attentive to the social: we have seen that the initiative of Italian fashion house has created to help people affected by the earthquake Emilia. 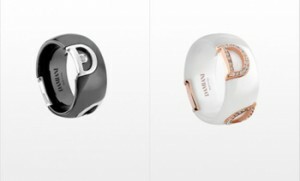 For the campaign for Pink Ribbon, the choice fell on the collection Damiani D.ICON, ceramic and gold rings and pendants that arise from the evolution of materials processing, with black and white ceramic that meet the gold and diamonds. The jewels of the collection are recognizable by the logo very chic: D capital is represented on the ceramic gold and diamond filled with full pave white diamonds. Buy the Damiani jewelry October 6 at the boutiques of Via Montenapoleone has a double value: to do good feeling beautiful. Because prevention and awareness is crucial, especially for a battle as important as that of the Pink Ribbon.